Sinabung (Sumatra, Indonesia): The volcano continues to erupt with little changes overall: the activity consists of slow extrusion of viscous lava, interrupted by intermittent explosions (every few days on average) caused by sudden pressure release of trapped pressurized gasses. An explosion this morning was reported to have produced an ash plume that rose to 14,000 ft (4,2 km) altitude and drifted NW. The rising magma inside the conduit continues to accumulate at the lava dome, feeding lava lobes on the steep upper flanks. From time to time, parts of these collapse, the avalanches generate small to moderate pyroclastic flows traveling down the southern and southeastern flanks. Dukono (Halmahera): Ash emissions continue to be observed from the volcano almost every day, suggesting that activity remains high. Darwin VAAC reported an ash plume at 10,000 ft (3 km) altitude extending 70 km to the WSW this morning. 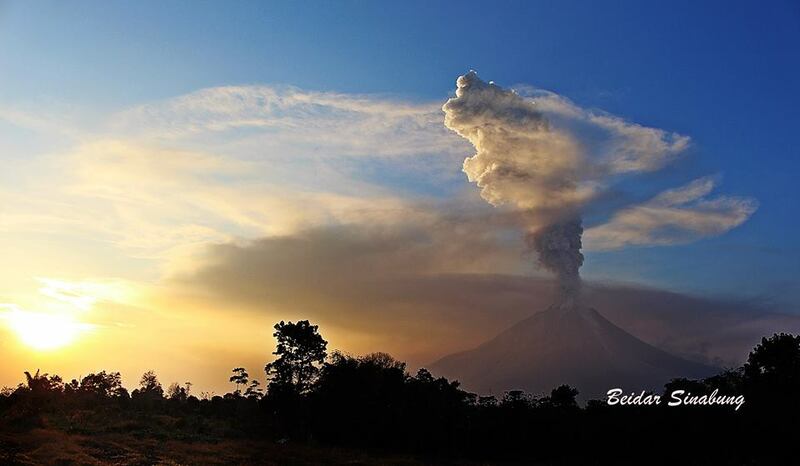 Nevado del Ruiz (Colombia): SGC and VAAC Washington seem to confirm that an ash emission took place. A large steam plume with possible light ash content can now be seen on a morning view of the webcam in Manizales. This morning, a pilot reported to The Colombian Geologic Service an ash plume from the volcano to 22,000 ft (6.7 km) altitude, which would indicate a moderate explosive activity at the volcano took place. Whether or not this is the case is unclear at the moment, as sometimes weather clouds are being mistaken as ash plumes, in particular if the observation is at night (as in this case). On the other hand, mild ash emissions from Nevado del Ruiz have been occurring intermittently during the past months and a somewhat larger emission as reported this morning would not come as a surprise.